Keysight Technologies, Inc. (NYSE: KEYS) today announced the availability of a high-accuracy tip and sample heater to expand the utility of its popular Nano Indenter G200. This easy-to-use solution uses a precise high-power diode laser to heat the sample and the indenter tip. Benefits include the ability to measure nanomechanical properties at precisely controlled temperatures and to test a wide range of samples under highly dynamic temperature conditions. To ensure reliable data, the system minimizes drift associated with heating by using function-optimized materials and an adjustable laser spot size. Keysight Nano Indenter G200 users also have the option to purge samples with various gases to avoid contamination and oxidation. The new tip and sample heater for the G200 supports a wide temperature range (RT up to 500 C) and is accurate to within 0.1 C. Another advantage is the high rate of the system’s heating and cooling processes. Depending on the temperature, the rate can exceed 20 K/sec in either direction. This capability affords scientists and engineers many new and intriguing opportunities for dynamic materials testing. Keysight’s laser-heated indenter tip, a critical component of the new system solution, prevents disturbance of the substrate temperature during measurement. This stability is critical for working with materials that have poor thermal conductivity and whose mechanical properties are strongly affected by temperature. Keeping the tip and sample at the same temperature as one another also allows G200 users to perform high-temperature continuous stiffness measurements with exceptional precision. The Nano Indenter G200 system’s substrate holder is optimized to provide the highest mechanical and temperature stability. To ensure simple and convenient G200 operation, the transparent plate underneath the sample contains a built-in thermocouple. 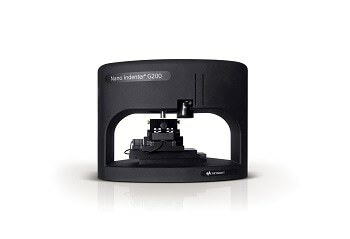 When the absolute highest accuracy is needed, such as for nanoindentation applications involving thick polymer samples, users can mount a thermocouple to the sample surface. The dual-loop PID controller’s NanoSuite interface offers complete NanoSuite software integration. More information about the Nano Indenter G200 is available at www.keysight.com/find/nanoindenter. Additional information about the U9820A-061 Laser Heater is available at www.keysight.com/find/G200-laserheater. Keysight Technologies offers high-precision, modular nanomeasurement solutions for research, industry and education. Exceptional worldwide support is provided by experienced application scientists and technical service personnel. Keysight’s leading-edge R&D laboratories ensure the continued, timely introduction and optimization of innovative, easy-to-use nanomechanical system technologies.